Joey, the Snowman wishes he had hands! If you’re looking for a new way to catch and keep kids’ attention AND help struggling students shine like stars in the new year, set up Center Stage in your classroom. Center Stage can be any central part of your room; nothing more than a space that all students can easily see. If you want to add a theatrical touch, go for it. For example, you can designate Center Stage to be in front of a SmartBoard and project an online stage curtain behind where you and students will stand together. Following are quick and easy poetry-based tricks with the tools you need to bring special magic to school – the magic to maintain focus, develop language arts skills AND help students who need to build self-esteem. One poem I’ve written is about a snowman on a gift bag who wishes he had hands. Joey, the Snowman wants to be an awesome drummer in the best of bands. The class gets to help Joey achieve his dream, with some surprises thrown in. 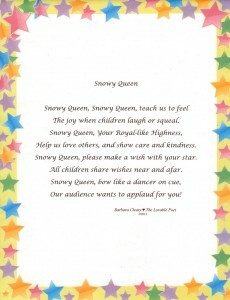 My second poem is about a snowy queen who helps children share wishes and learn to show the valued character trait of kindness. Copies of both poems in decorative print with illustrated borders are included in this post. Enjoy this wintry writing and share it with your class when the season is right in your part of the world! 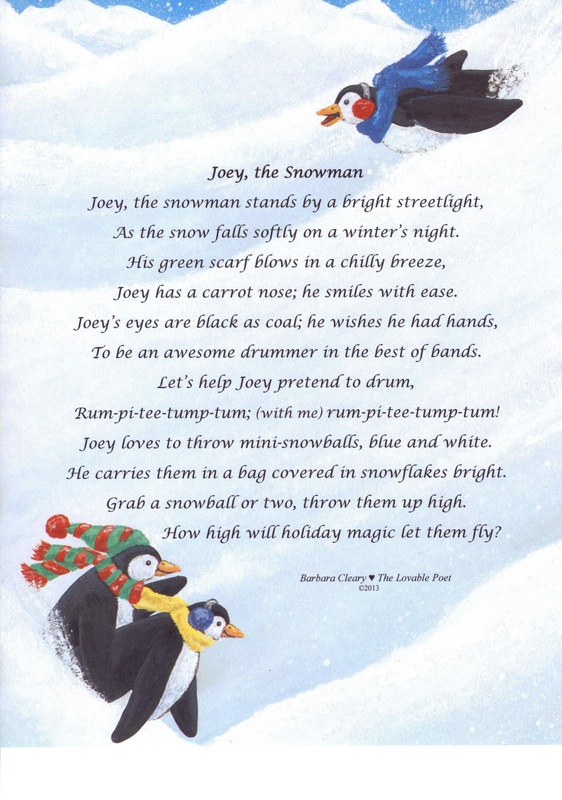 Joey, the Snowman and Snowy Queen are couplet poems. Every two lines rhyme. Traditionally couplet poems are published with space between each pair of lines. I’ve skipped the spaces to save space on each poem page. Penguins in this print of Joey, the Snowman laugh at Joey’s antics. 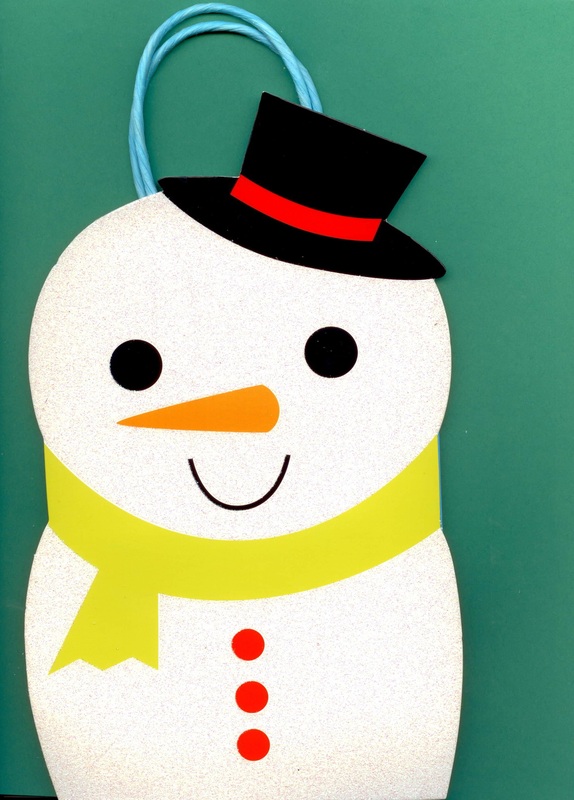 Joey, the Snowman teaches kids to write what they SEE. The poem describes the snowman gift bag itself. When I present this poem in K – 2 classes I place small soft white and blue “snowballs” inside the bag. I select a volunteer boy to “act out” Joey and to reach into the gift bag at the right moment in the reading of the poem and throw the mini-snowballs up in the air. Children are delighted with this activity! As the snow falls softly on a winter’s night. Joey has a carrot nose; he smiles with ease. To be an awesome drummer in the best of bands. Joey loves to throw mini-snowballs, blue and white. He carries them in a bag covered in snowflakes bright. Grab a snowball or two, (direction to Joey) throw them up high. How high will holiday magic let them fly? After you invite students to star on your Classroom Center Stage and act out what the poems are about as you read them aloud, use these wintry poems to lead into a writing lesson. 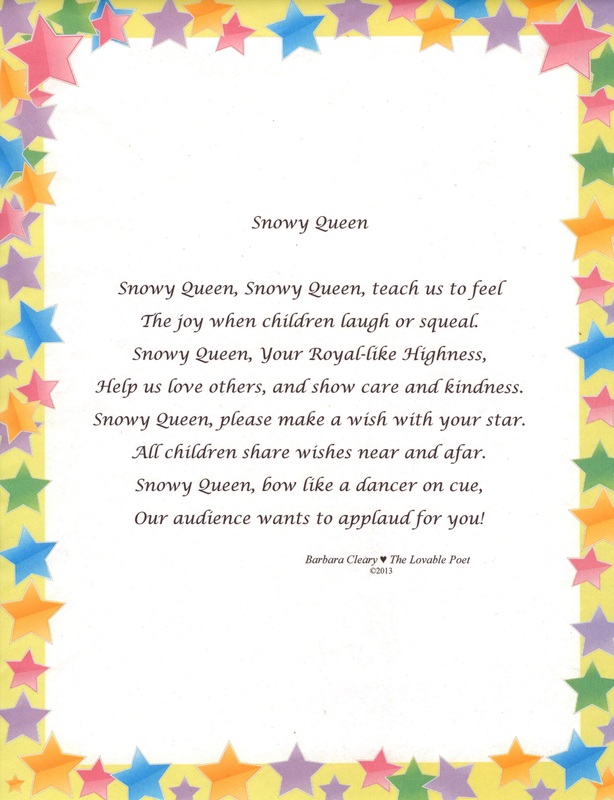 Ask the class to write couplet poems of their own about a character who faces a difficult challenge or wants to share wishes with children around the world, like Snowy Queen. Post the poems on a board as writing models for the class. Discuss the poems’ structures and how to write with rhyming words at the end of each two lines that rhyme. The key in couplet poetry writing is that the ENDING words in each couplet rhyme with each other. Snowy Queen’s tiara cost all of one US dollar. It’s value to help struggling students? Priceless! Snowy Queen teaches kids to be kind. This poem is about feelings. I select a volunteer girl to “act out” Snowy Queen when I present this poem to early learners. 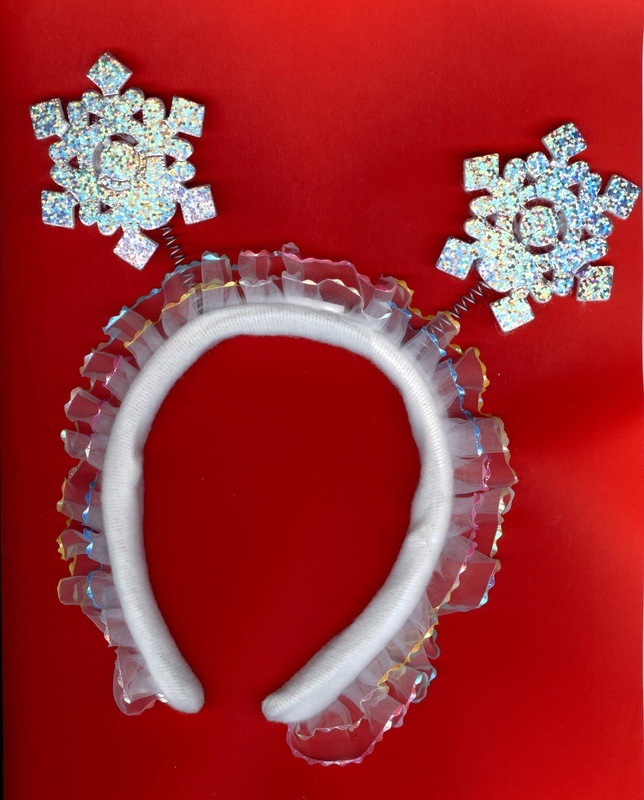 I ask her to wear a tiara with sparkly snowflakes that I bought for this activity. Snowy Queen’s (plastic) staff has star power worth its educational value in real gems! With dramatic flair, my student volunteer also takes a bow on cue, and the audience applauds loudly with joy. The joy when children laugh or squeal. Help us love others, and show care and kindness. 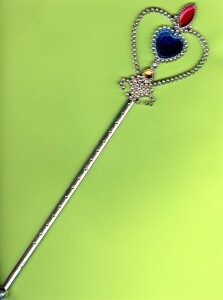 Snowy Queen, please make a wish with your star. All children share wishes near and afar. Snow Queen, bow like a dancer on cue. Our audience wants to applaud for you! Snowy Queen is fittingly printed on paper with a border of stars. Snowy Queen teaches the value of showing love, care and kindness. Some of the best tools and tricks for catching and keeping kids’ attention are ones that draw positive attention to struggling students. Please send comments and subscribe to Attentionology. Let me know what you’d like me to write about in 2017. ‹ Help Kids Organize to Focus! 5 Pings/Trackbacks for "New Year Idea: Let Struggling Students Star on a Classroom Center Stage"